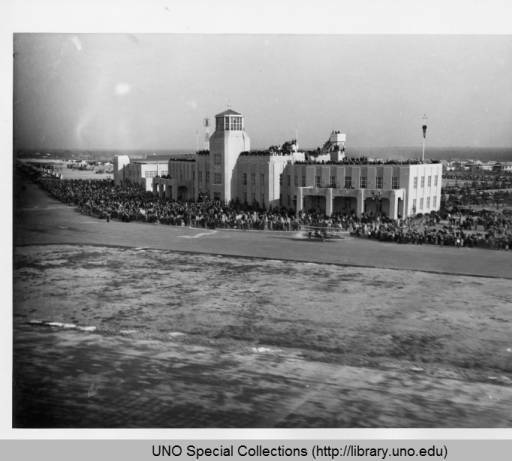 On February 9, 1934, the first Mardi Gras after Prohibition was repealed, hundreds of people crowded around the airport to see the Pan-American Air Races. Abraham Shushan, the Henderson brothers (air race promoters), and Harry Williams planned these races, which included Central and South American flyers and dignitaries. 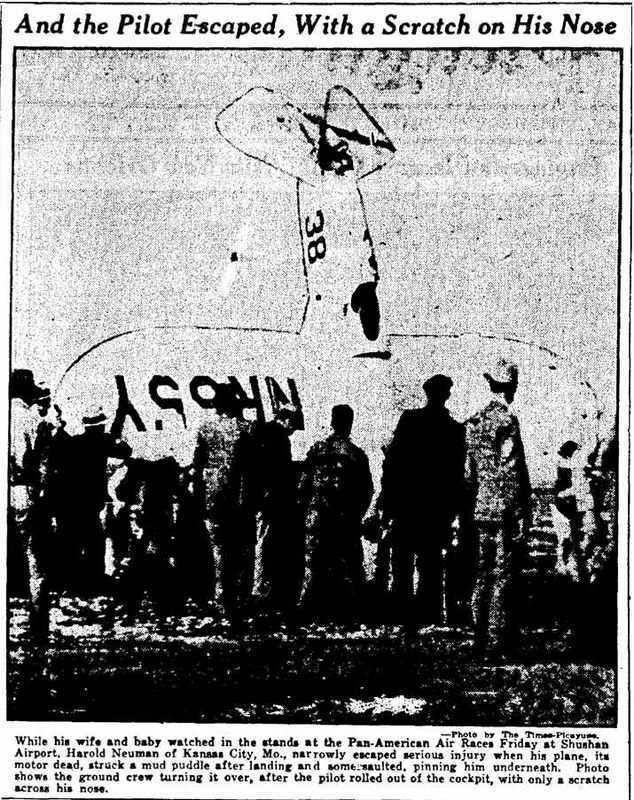 The pilots represented all cities in Louisiana, including notable pilots Jimmy Haizlip, Roscoe Turner, and Jimmie Wedell. The 20th Attack Squadron from Barksdale Airfield (known today as Barksdale Air Force Base) also performed, demonstrating the importance of air defense while simultaneously entertaining the crowds. The audience included Governor O.K. Allen, Mayor T. Semmes Walmsley, and Richard Leche. Franklin Roosevelt would have attended, but he was busy signing an executive order to cancel all civil airmail contracts. The unfolding “Air Mail Scandal,” in which smaller airlines complained of unfair treatment in attempts to obtain airmail contracts, forced Roosevelt to act. Unfortunately, bad weather forced postponement of the dedication to February 14, but people enjoyed an exciting show with death-defying stunts when the races resumed. These stunts led to a few accidents, including the death of Captain Merle Nelson. Though he had survived the night flight crash, he burned alive after his plane exploded. The races helped generate even more excitement for the airport, but it made aviation appear to be an extreme sport rather than a safe way to travel. Some airplane manufacturers thought that marketing airplanes the same way automobile executives advertised cars would help. They did not realize the dream of an “airplane in every garage,” but business executives used planes heavily even in the Great Depression, which helped to show people that passenger planes were safe. 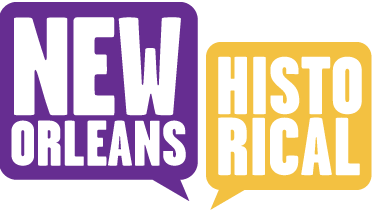 After the air races, New Orleanians and many high-powered visitors knew that the city had taken a great leap ahead with their new airport. To learn about the beautiful art deco administration building, turn around and head back to the sidewalk. Stand on the end of the side walk and face the building. 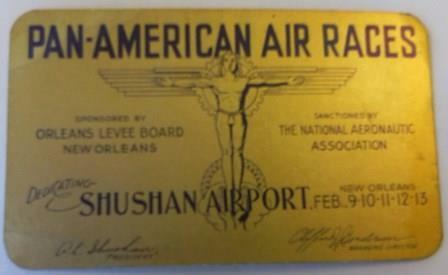 The Golden Ticket: Tickets for the Pan-American Air Races went on sale on December 31, 1933. Item courtesy of the Abe L. Shushan Collection, Earl K. Long Library, Photo taken by author. Danger at the Races: As the clipping states, Harold Neuman of Kansas City, Missouri, narrowly escaped serious injury when his plane flipped over. In this photograph, his crew is righting the plane. Courtesy of The Times-Picayune. Teresa Thessen, “The 1934 Pan-American Air Races,” New Orleans Historical, accessed April 19, 2019, https://neworleanshistorical.org/items/show/605. Vincent Caire, Louisiana Aviation: An Extraordinary History in Photographs, Baton Rouge: Louisiana State University Press, 2012.